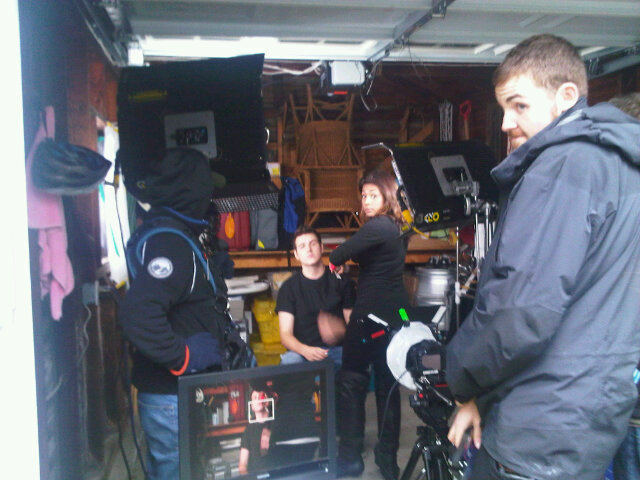 Photo from @YukariP's phone, our Line Producer and Twitter Queen. I know I need to write down my reflections on shooting our teaser/trailer yesterday, but I must admit - I'm knackered! So this will be short, but sweet I hope. We shot on the Canon 5D with separate sound files over about 5 hours yesterday afternoon in my garage for our feature film, Locked in a Garage Band. We were shooting for a teaser/trailer that will be 45 seconds long and should be complete and ready to show the world by January 1st 2011. The day's objectives were to have fun, get to know our cast & crew & see how we all get along before we go into April's 10 day shoot, and to cut a teaser that will be used in our Kickstarter campaign and in our social media marketing efforts. It's all to create buzz, get more $ in place and start building up an audience for our movie. 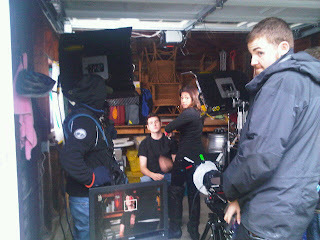 Read on for my thoughts & advice on how to shoot a teaser/trailer ... in the rain. When shooting in the Pacific Northwest in December, prepare and plan for rain. Just the way it is I'm afraid. Garbage bags are really handy. They can protect gear from rain, be used as hair protectors and of course, be used to collect garbage at the end of the shoot. Hiring a competent, fun crew is really awesome. Love our crew! Seriously - they came up with great ideas, made us laugh, had an incredible selection of tape in every possible colour of the rainbow, and hardly took any time to stop & eat. When people are working for free, you gotta feed 'em well. Actually, even when people aren't working for free, you gotta feed 'em well. And not just sugary junk. That'll cause lots of problems a few hours later. Bringing a Wii or other game system will make for a fun day. Click here to see a picture of some of the cast playing Mario Cart. Make a schedule & stick to it. We told everyone that we hoped to get them on the 7pm ferry back to Vancouver, but in actual fact we had planned to get them on the 5pm. So when we wrapped and packed up at 3:15, in time for them to catch the 5pm ferry, the entire cast & crew were super-impressed. They told us horror stories of shooting independent movies until 7am when being told they'd be done by midnight. Yuck! Under-promise, overachieve. Such a simple rule. When it's done, you might feel a rush of emotions, ranging from relief, to sadness that it's over to elation that the day rocked. I felt all those feelings this morning and must admit - it was really overwhelming & unexpected! I even had to go for a jog to re-ground myself. Back up your files & then back them up some more. We didn't so much learn this yesterday as know this already, but I might as well add this to the list. We purchased a 1 Terabyte external hard-drive from our local Apple store, and sent it on to our editor in Austin, Texas with our teaser/trailer files from the day. We backed it up on my laptop and my sister's desktop, plus our sound guy & DP have copies. I think we're safe. What am I missing? Please leave your million bucks below & let me know what you think, want to know, or care about.